After a cool start to a November that produced a couple rounds of light snow across the Upper Midwest, the latter half of the month has been well above normal across the Midwest. With the warm weather taking hold, people are asking, "What does it mean for the winter?" While there is little correlation to how the weather in November determines the rest of the season, yet there are methods meteorologists can use to gather insight on what to expected through March. 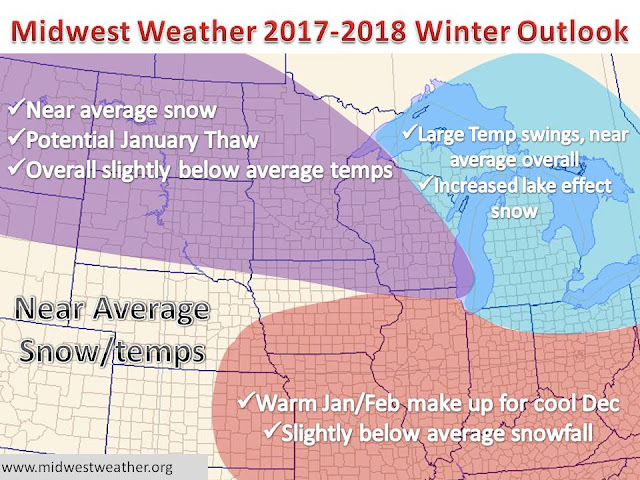 With meteorological winter starting tomorrow (December 1st), it is finally time to unveil the official Midwest Weather winter outlook for the 2017-2018 season. To jive your memory, let's take a look at last winter. 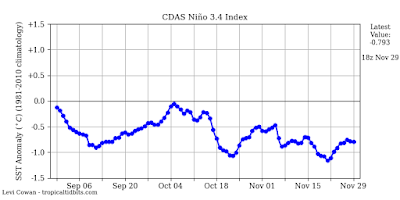 It featured a neutral ENSO to near-weak La Nina, meaning the ocean temperatures in the equatorial Pacific Ocean were near normal or slightly below normal. 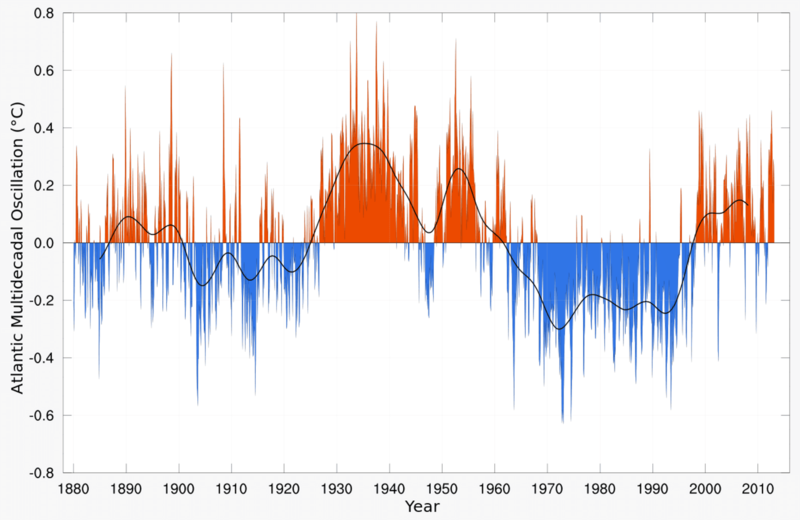 When neither a La Nina or El Nino develops, other climatic processes carry more weight and will have more of an impact on the weather across the United States. Above is a look at temperatures and rain/snow amounts compared to average. According to the Midwestern Regional Climate Center, the Midwest saw temperatures run a few degrees above normal, with precipitation dependent on two storm tracks that brought above normal rain/snow amounts from Iowa into parts of Wisconsin, and kept other parts of the region below average. The winter forecast posted Last Year, panned out fairly well. With the 'increased risk for larger storms' in the upper midwest, 'below average snow' in the Mid-Mississippi River Valley, along with 'increased lake effect' the forecast generally held up. The temperatures ended up warmer due to a very warm second half of February, with record highs ruled the land. Now let's take a look at what to expect for this upcoming winter. Using current conditions of the oceans and atmosphere can work to forecast upcoming winter conditions. Four climate processes will be examined to determine what are called analog years, or years that are most similar to this upcoming winter. The status of ENSO, PDO, QBO, and AMO will be studied and compiled to develop our winter forecast! Climate models and trends are suggesting that a La Nina is in the process of developing for this winter. 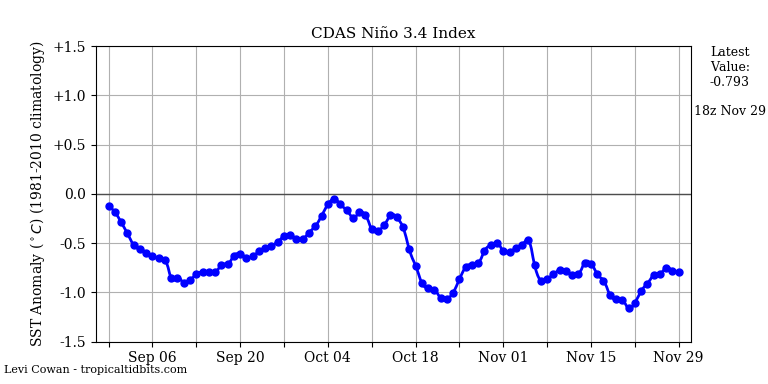 Typically when the index is more negative than -0.5, a La Nina is then classified. While we are expecting a cooler than normal equatorial Pacific, it will not be extensively cool. Model consensus is expecting the status of ENSO to run about -0.8 through much of the winter. Below is a higher time step resolution, with the current value measured at near -0.8, yet will fluctuate day to day. The PDO is another dynamic ocean pattern on a longer time scale than ENSO. Typically it can change from phase to phase over the course of a decade or longer. The PDO has been in the warm phase over the past several years, yet there are signs it may lean to the cool side this winter or hover around neutral. The latest observed value was -0.62, down from values near 0 earlier in the Fall. A visual representation of the PDO flipping to the cold phase is above, current sea surface temperatures, via tropical tidbits. Notice the blob of warmer than average SSTs in the Northern Pacific, with pockets of cooler than average SSTs in the vicinity of the Gulf of Alaska. Its subtle, but does match the cold phase of the PDO in the image above better than the warm phase. In our analogs, we will use a slightly negative PDO value throughout the winter. The AMO is a similar process in the North Atlantic, yet on longer time scales. It has been in the warm phase for a couple decades now, and is expected to continue through winter. We will use positive values for collection of analog years. The QBO is a oscillation in the wind direction within 15 degrees of the equator. It tends to have a periodicity of nearly 2 years and is currently settling into a negative phase. Above is a look at the variation of the QBO, notice the flip to negative just this Fall, with the trend of more negative values to continue based on history. For our analogs, we will use increasingly negative QBO values through the winter months. We will then use each of the four climate values as predictors, normalized to equal magnitude. A database was set up with each index from every month back to 1950. Below are the expected values for December through February, with the months/years in the past that are closest fit. In both December and February the top 3 years were used. 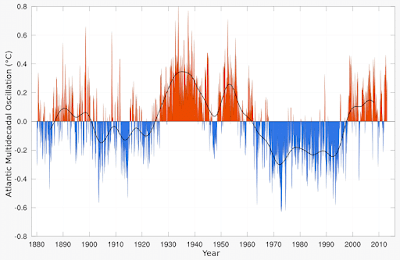 In January the top 5 years were used due to the large differences in a cold 1963 and warmer other similar years. In February the top 3 years were used, with more weight given to 2012 since it was much closer to expected conditions than the next closest year. So What does this all mean for the Midwest? Based on the analog years, the winter of 2017-2018 looks to start with a cool December, trend to a warmer than average January and possibly head back to a near or slightly below normal February. The highest confidence in the forecast is during December and February. January is a little more tricky since the top year (1963) was a cold month for the entire country, yet the rest of the analog months came back as warm. A breakdown in the polar vortex could send cold air spewing south (like it did in January of 1963), but it could easily end up in Europe or Asia. While January looks to either go very cool or warm, odds suggest the warm scenario will pan out with 4 of 5 analog years fitting this idea.